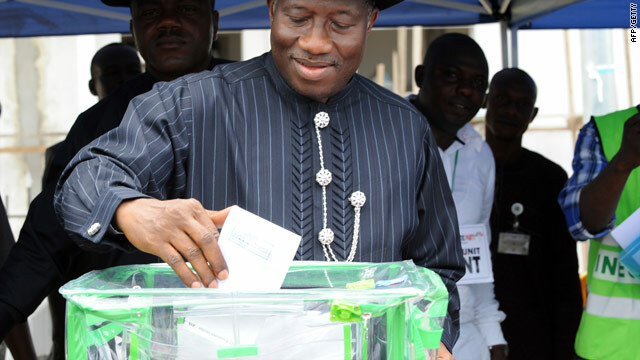 Incumbent president Goodluck Jonathan casts his vote Saturday in his home ward at Ogbia district in Bayelsa State. Kaduna, Nigeria- Nigerians headed to the polls Saturday to vote for president, a week after parliamentary elections were marred by violence and accusations of fraud in Africa's most populous nation. The former vice president assumed office after President Umaru Yar'Adua died last year following treatment for a kidney ailment in Saudi Arabia. 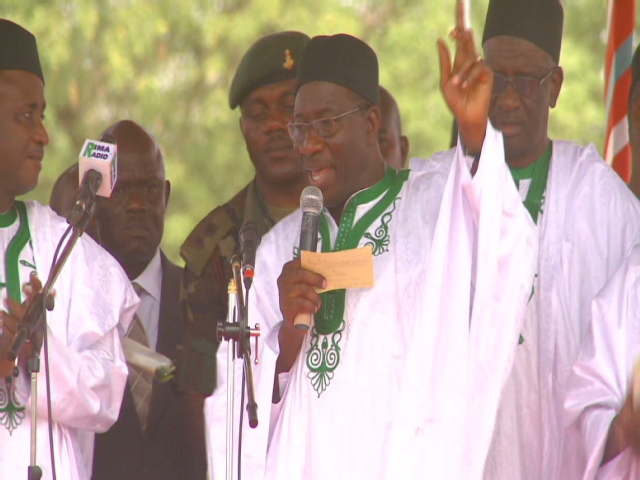 Jonathan has led the nation of about 150 million people since May. About 73 million people are registered to vote. His main challenger -- former military ruler Muhammadu Buhari -- was a contestant in the past elections in 2003 and 2007. Buhari is the candidate for the Congress for Progressive Change. Other candidates include Nuhu Ribadu and current Kano state governor, Ibrahim Shekarau. The winner faces tough challenges in the former British colony that has been mostly under military rule in its 50 years of independence. For starters, to avoid a runoff, the winner must get at least a quarter of the vote in two-thirds of the 36 states and the capital. The ruling party has a tradition of alternating power between the mostly Muslim north and the Christian and animist south after two terms in office. The rhythm was broken when Jonathan, a southerner, succeeded Yar'Adua during his second term in office. Some ruling party leaders have demanded a candidate from the north. Outbreaks of deadly violence have affected parts of the oil-producing Niger Delta region since the west African nation returned to democracy in 1999. Ethnic strife has also left scores dead in some parts of the west African nation, including in the city of Jos. On the eve of the parliamentary vote, a bomb exploded at the Independent National Electoral Commission office in Suleja in central Nigeria, officials said. A bomb exploded in northeastern Nigeria early Saturday, authorities said. The blast was in Maiduguri city in Borno state, according to a spokesman for the National Emergency Management Agency. Gunfire also rang out in the city, the spokesman said. It was unclear whether there were any casualties. 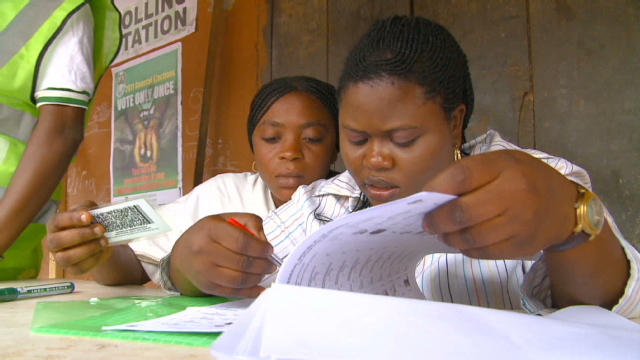 Nigerians voted April 9 for 360 House of Representatives seats and 109 Senate seats. After the presidential election on Saturday, a gubernatorial vote will be held on April 26. A new election chief promised free and fair elections, but the electoral commission was forced to put off elections by a week after logistical problems, including party logos missing from ballot papers, were reported nationwide. It was a major setback reminiscent of the nation's 2007 elections, which the European Union described as filled with rampant vote rigging, violence, theft of ballot boxes and intimidation. A functioning democracy is important for Africa's most populous country and the largest oil producer in the continent. Nigeria is a major supplier of crude oil to the United States, and hosts many Western oil companies and workers. Nigerians are harnessing the power of the internet to demand accountability and encourage citizens to get involved in the voting process. The west African nation has 43 million internet users -- the largest in Africa -- and they are increasingly using Twitter, Facebook and blogs to report cases of voting problems during the election season.